If you'd like to make a living as a home care aide or a home health aide, improve your chances of landing a job in the field by familiarizing yourself with the common questions people in your profession are asked during interviews. Prepping for your interview in this manner will likely make you more confident and self-assured when you meet prospective employers. Moreover, your answers will be well thought out and comprehensive, giving you the edge over the competition. Keep in mind that interview questions will be specific to the unique job you're applying to, so don't expect the sample questions below to be the only ones asked of you. 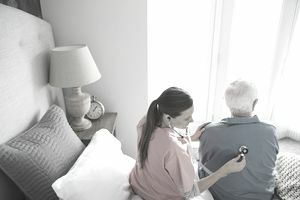 Depending on the job, you might be interviewed by an agency (if you are working with a home health aide service or agency), by the family of the client, and/or by the client him or herself. The questions you are asked might depend on who interviews you. For example, the client’s family might ask you more questions about your bedside manner and your ability to handle the client’s particular situation. Regardless of who interviews you, there are a few types of questions that you might get during an interview for a home health aide job. Common interview questions. Many questions will be common interview questions you might be asked at any job, including questions about your work history and your skill sets. Some of these common interview questions will be personal questions about your character. For example, expect the interviewer to ask why you are interested in the field. Caregiving, after all, can be taxing, stressful and requires a lot of hard work. What makes you want to pursue this field that can often be thankless? Questions about practical experience. You will be asked about your practical experience in the field. For example, what types of conditions have you helped clients manage in the past? Specifically, they'll want to know if you have ever cared for someone in a condition similar to the client or clients. Employers will also want to know if there is any aspect of this patient's condition that makes you uncomfortable, so they can address the matter early on and before you're faced with this situation. Practical experience questions also include questions about technique. You might be asked about a specific skill, such as how you would appropriately transfer a patient from a bed to a wheelchair, or whether or not you know how to handle a catheter. Behavioral interview questions. Employers want to know how you will handle various situations with your clients. One way they will try to figure this out is to ask you behavioral interview questions. These are questions about how you’ve handled certain work situations in the past. For example, you might be asked about a time you had to handle a difficult patient or family member, or a time you had to make a difficult decision. The idea behind these questions is that how you behaved in the past gives the interviewer insight into how you might behave on the job. You might also get some situational questions. These are similar to behavioral interview questions, but they are about how you would handle future work situations. For example, an employer might ask what you would do if a client was unresponsive. Questions about the industry and/or company. If you are interviewing with a particular agency, you might get questions about why you selected this agency, or what you like about the organization. Be sure to research the organization before your interview so that you know a bit about the company. You might also get more general questions about the healthcare industry, or home health aides. You don’t have to be an expert, but make sure you can say something about how important home healthcare is for certain populations. Highlight your experience. Before the interview, look back at the job listing. Circle the skills and qualities in the listing that seem most important to the job. Then, think about experiences you’ve had that demonstrate these skills. You might want to look back at your resume and cover letter to refresh your memory. By thinking of particular experiences ahead of time, you’ll be able to come up with examples more quickly during the interview. Demonstrate your soft skills. Patience, empathy, and communication are all important soft skills for a home health aide. Display these skills during your interview. For example, be sure to listen closely to the questions being asked. Answer in clear, easy-to-understand responses. Be sure to smile and be friendly to everyone you meet. The way you act in the interview will show the employer what kind of aide you might be. Use the STAR interview technique. When answering a question using a specific example from your past, use the STAR interview technique. Describe the situation you were in, explain the task you had to accomplish, and detail the action you took to accomplish that task (or solve that problem). Then, describe the results of your actions. This technique is particularly useful when answering behavioral interview questions. Practice, practice, practice. Thoroughly practice answering common interview questions, including the questions below. Ask a friend or family member to ask you questions so you can practice. The more you prepare, the more easily you will be able to answer questions during the actual interview. Practice will also help you feel more relaxed during the interview so that you can put your best foot forward. What made you want to become a home health aide? What motivates you to do your best as a home health aide every day? How would your former employer describe you? What are your greatest strengths as a home health aide? What formal training do you have in healthcare? Do you have first aid/CPR training? Do you specialize in any particular conditions, age groups, etc.? Do you have experience with quadriplegic care (or another condition related to the patient)? Are you comfortable doing light housework? Do you have experience with monitoring a patient’s vital signs? Do you have experience with bathing patients? How do you keep your patient’s family informed about the patient’s progress? Describe a time you had to make a difficult decision regarding a patient. Describe a time you went above and beyond for a patient or for a family. Tell me about a time you had to deal with a particularly demanding client or family member. What did you learn? Describe your most rewarding experience with a client. Describe a time you resolved a conflict with your patient’s family. What was the problem? What was the outcome? Tell me about a high-stress situation you dealt with, and how you handled it. Tell me a time you had to explain a new concept to someone. Tell me about an emergency situation at work. How did you handle it? Have you ever lost your patience with someone you were caring for? What happened? Have you ever made a mistake while working with a patient? How did you resolve the error? How would you handle a patient that resists your care? What do you do if you suppose a client is being abused by his or her family members? What would you do if, 15 minutes after your shift, your replacement has still not arrived? What do you think is the future of home healthcare? Why did you select our agency? Do you have any questions about our organization/family/client? What do you like and dislike about home care?